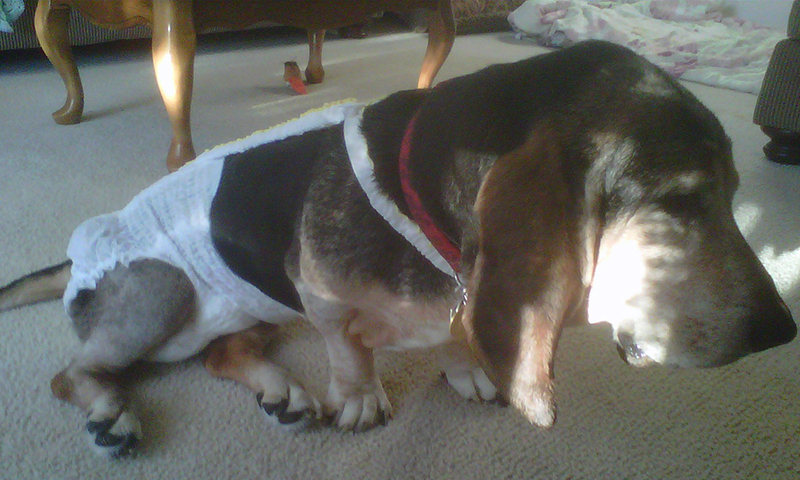 *For best fit, the waistband of the diaper should not fall more than an inch below the dog’s waistline. This is especially important for male dogs to ensure adequate coverage and prevention of leakage at the waistband. Written instructions with illustrations enclosed with every purchase. Manufactured in USA under Patent Numbers 6,935,278, 6,675,745 and 6837191. Do-Rites, the Do-Rite logos “Even a Good Dog Can Have a Bad Day” and “Keep the Diaper on the Dog and the Dog in the Diaper” are trade marks or registered trade marks. 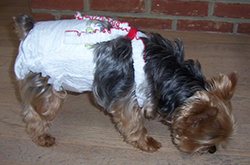 Please do not let your dog chew or eat the diaper. Discard used diapers in appropriate trash receptacle. Not all dogs are candidates for our Ready Made Line. In those instances, we offer Custom Tailoring as needed. 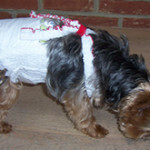 Consequently, we offer custom tailoring services for those hard to fit breeds. Our service includes; two free sessions with a personal designer who will provide guidance in using the measurement kit via Skype, Face Time or telephone; one to two mock up diapers; measuring strips and prepaid postage for returning the measurement strips. To order the Measuring Kit for Custom and/or Tailor Made Do-Rites, contact our office and leave a message at 888-770-0111. The service costs $25.00. 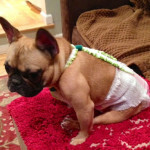 Elli is a French Bull Dog. Her A-B length is 9 and weight is 13 pounds. She is wearing an XS 4/5 size. Custom fitting of diaper was required. Mr. Leo is a small Yorkie. He weighs 7 pounds and is wearing an XS 2/3 from the Teacup sizes. 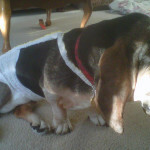 Custom fitting of diaper was required. Jessie weighs 58 pounds. 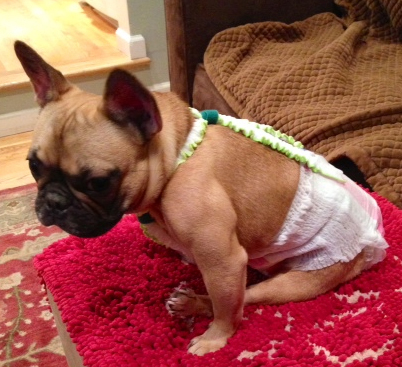 Custom Fitting was required for her straps and diaper.